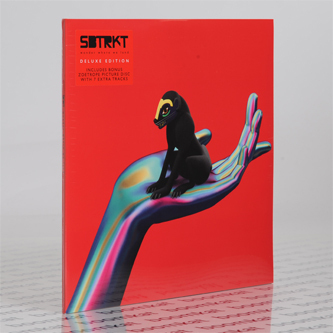 **Deluxe edition double gatefold jacket includes bonus zoetrope picture disc with 7 xtra trax** Young Turks present SBTRKT's strongest body of work to date with the electronic pop/soul projections of 'Wonder Where We Land'. Teeming with guest spots from A$AP Ferg, Koreless, Sampha, Jessie Ware, Warpaint, Ezra Koenig (Vampire Weekend), Caroline Polachek (Chairlift), and Andrew Ashong, among others, it marks SBTRKT as a properly dilated producer, one open to working fresh new sounds and bolder production technique into more timeless dance-pop frameworks. At this point, the hooks of upfront singles such as 'New Dorp. New Dorp', 'Higher' and 'Voices In My Head' have done their job and settled right in, priming us for instrumental aces such as 'Lantern' or 'Paper Cups' with their spiralling trance motifs, or the dreamy lean of 'Everybody Knows', plus a handful of brand new exclusive vocal joints like the etheric D&B inversion of 'War Drums' with Warpaint, or the wickedly detuned soul slouch, 'Maybe' with Andrew Ashong and Sampha.